LXT Lithium-Ion battery and optimum charging system produces 280% total lifetime work with 2x more cycles. 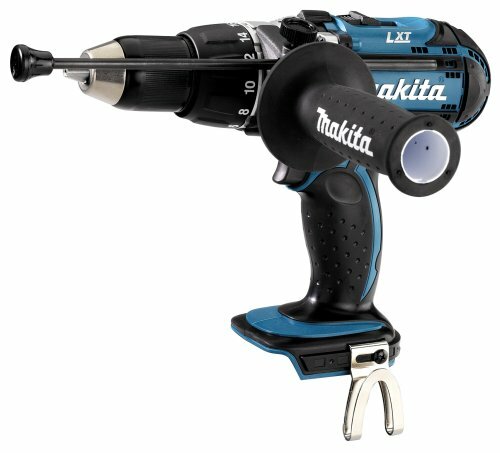 Makita built, 4-pole maximum torque motor delivers 560 in. lbs. of efficient torque in a compact size. Compact design at only 9-7/8 in. length and weighs only 4.9 lbs. for less operator fatigue. Ergonomic shape fits like a glove with even pressure and easy control. LXT Lithium-Ion provides longer run time, 5x lower self-discharge (for use any time) and 16 firm holding contact terminals (for constant high power). 45-minute Optimum Charger and battery communicates throughout the charging process using the built-in chip in the battery and built-in CPU chip in the charger. The Charger also uses Active 3 Control for current control, thermal control & voltage control. 45-minute Optimum Charger has a built-in fan to cool the battery to produce more lifetime work. Two built-in L.E.D. lights for more illuminated work. 3-Speed design produces 25% faster working speed with more efficiency in a wider range of applications. Shift-Lock drive system quickly shifts from hammer drill to driver mode with one touch. Two-piece armature and field along with externally accessible brushes for serviceability and longer motor life. Outstanding product -- very well made and easy to use. Excellent for driving large wood screws and lag screws. The only quibble I have is the need for special bits. I own the LXT300 kit already (fantastic value, by the way), but needed a second drill for cabinet work. Since I already own 3 LXT 1.5AH (compact) batteries, this was the perfect solution for me. 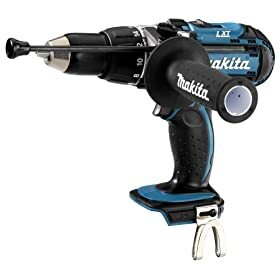 I'm going to assume that you already know of the quality of Makita tools, so I'll skip to the chase...YES, ITS REALLY A BRAND NEW LXT BHP452 HAMMER DRILL. I recieved the unit exactly as advertised, within the promised time frame and I couldn't be happier. This drill has the same great ergonomics and balance of the compact LXT (white) but has a smoother, more easily controlled trigger. It will accept either the compact 1.5AH or the larger 3.0AH batteries. It does not include a depth stop or side handle as pictured, but I'm okay with that for [...] bucks. I've owned this for about a year. It has worked beautifully every time. Drilling or driving, it's great! Lots of torque. Speed selector makes driving screws cake. The battery lasts long too. This is the most wonderful drill I've every had. It is cordless and the Lithium-Ion batteries charge up quickly and last a decent amount of time. It has a nice direct drive to it, starting and stopping quickly. Although it can be used as a power screwdriver it is better as a drill due to it's weight.